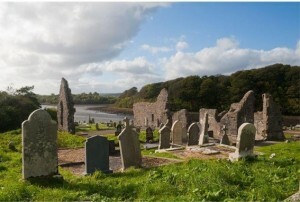 The site is in a graveyard just south of Donegal Town. Remains: parts of the choir, transept chapel and cloisters. 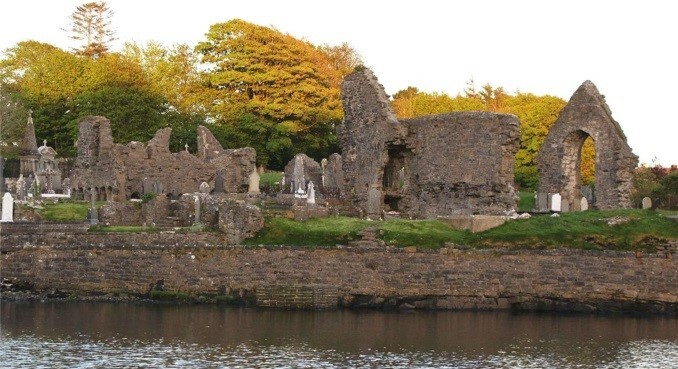 Despite its fame, Donegal friary was a rather late foundation. It was founded by Nuala O’Connor and her son, the first Red Hugh O’Donnell, for the Observant friars in 1473-4. It was damaged by an accidental fire in 1536. Under Irish protection, it escaped suppression until raided by the English in 1588, who then occupied it as a fort. They were expelled by the Red Hugh O’Donnell, whose brother-in-law, Niall Garbh, later seized it for the English again. On the morning of the 20th September 1601, the building was almost destroyed when the gun-powder stored in it exploded. Efforts to re-build it for the friars ended after the Flight of the Earls. The friars went to live by the banks of the river Drowes, the scene of much of the work on the Annals of the Four Masters. Individual friars worked in Donegal down to the middle of the last century, and the late Cardinal Logue, who was born in 1840, claimed that he had been baptised by a wandering friar in South Donegal!